So, I randomly won tickets to this event on Monday and the event was on Wednesday. Holy short notice! I hadn't heard of the event until I entered the draw. It looked interesting so I was pumped when I won tickets. 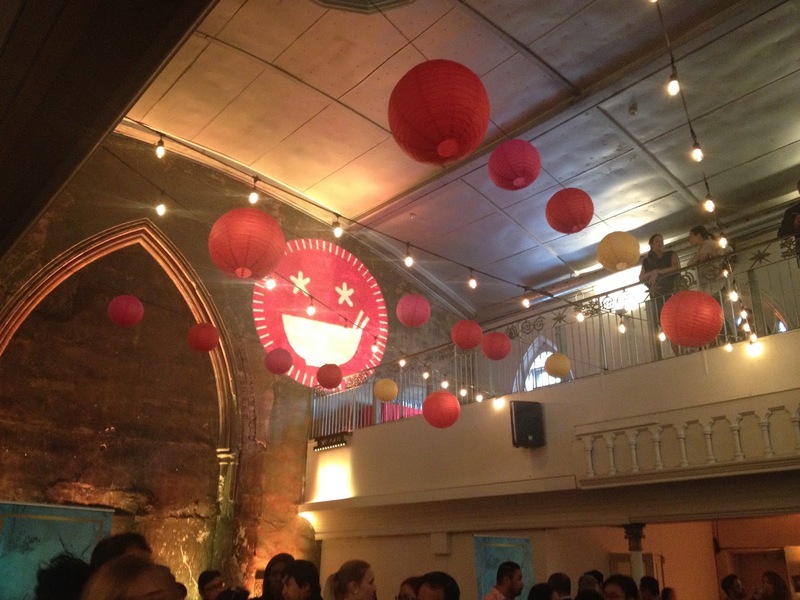 Asian inspired food and drink? Count me in! My Chef Aunt and I arrived, curious about the event. She said this venue, Berkeley Church, was beautiful. Old and churchy, the facility had been transformed into a lively space with a large, U shaped balcony, a stage for the DJ and plenty of space to walk around. I was worried about the capacity of this place, but they didn't have enough tickets to squish you in like sardines; it was perfect. Servers walked around with our samplings, but you had to be quick. I was only able to sample 3 items: Gyoza, Chicken Satay Skewers and Butter Chicken. The gyoza were tender and light. I've had gyoza at many AYCE restaurants, but THIS is what quality tastes like. Next, I hunted down some Butter Chicken. 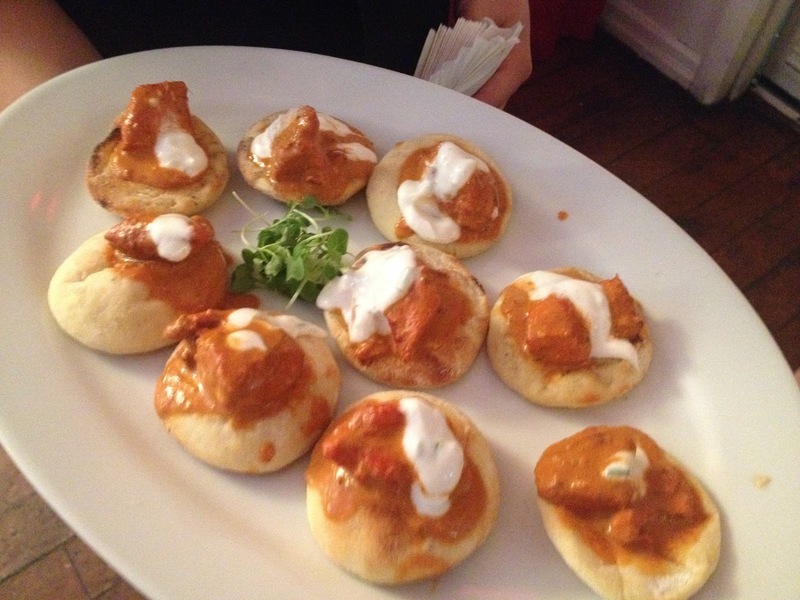 The tiny naan were adorable! I could've eaten the whole plate! It was good, but not spicy at all, zero heat. I expected a little, but I'm not complaining, they were very good. My favourite was the Chicken Satay Skewers with Peanut Sauce. The chicken was seasoned well and the peanut sauce was to die for; I'd put it on anything. Wish I could've tried more! There were multiple bars to try each restaurants' special cocktails. Each had 2 for your to try, The lines weren't long, but I don't think all of them were prepared for this. Some were very prepared. A few had the drinks pre-made in punch bowls or hollowed watermelon. This event is sponsored by Bombay Sapphire gin, so many of the drinks were made with this smooth liquor. Our favourites were Delicate Warrior from The Rivoli, Check My Credentials from Miller Tavern on Bay and Stay Fresh from Soho House. Our least favourites were Green Dragon from The Good Son and The Award Tour from Bent. Each cocktail was so unique, you cannot compare it to anything else. With each sip, you're trying to pick out each ingredient....or all you taste is tequila. Either way, it's a good time. We tried many drinks and the food to drink ratio should have been a little closer than 1:4. There were bowls of party mix everywhere, but when it came to the sampling list, you had to be quick. The servers didn't usually get too far! I spent too much time waiting in line at each bar to catch everything. There definitely needed to be more food and more servers for how many drinks were served. Open bar needs more food! It was a fun event. The DJ was fantastic and the people we met were amazing. Everyone had a great time and I'm pretty sure everyone would do it again. Hope it comes back again!